The photo to the right features our Grand Prix Simulator. This system includes 40 international racing circuits, triple wraparound monitors, six speeds, clutch, brake & accelerator pedals, surround sound systems, commercial grade high-G-force steering systems and attached keyboard to adjust car setups. It's loud, life-size and attracts a lot of attention. 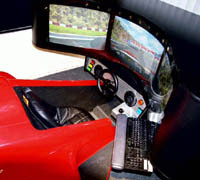 Multiple machines can be linked for side-by-side racing. Our most popular machine for trade show and corporate marketers. Fantastic for motor racing sponsor with traveling hospitality suite. This is the "Granddaddy" of commercial racing simulators. It is MASSIVE and loud! Measuring about 150 ft. x 150 ft. when totally setup, this mobile attraction travels throughout Europe in a large transporter. 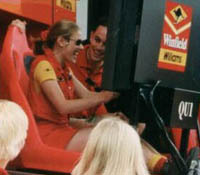 It features a Formula 1 car on a motion platform system, Outdoor Barco Light Cannon Imaging Systems beaming on a 20ft panoramic monitor screen, 4 prequalification simulators with 42-inch Plasma monitors, concert audio systems, two F1 Show cars lowered by crane into carrousels, merchandising area, models and an elevated stage area for driver and celebrity appearances. Click this image to the right. It's cool.